Today Tracy Banks presented a check for $54,900 to Heather Faria, Executive Director of the Concord-Merrimack County Society Prevention of Cruelty to Animals (SPCA). In the months of June, July, and August, Banks pledged to donate $100 for every new vehicle sold to the SPCA. 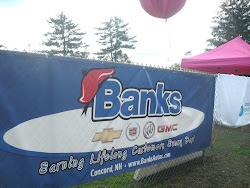 Between those three months, Banks was able to sell 549 new cars, which raised the amount of the check to $54,900. The donation will help the SPCA build their new facility on Silk Farm Road in Concord, New Hampshire. The SPCA is dedicated to caring for abandoned and homeless pets, protecting and advocating for pets in need, and promoting the humane treatment of all animals. The Concord-Merrimack County SPCA envisions our community to be a safe haven for animals, where the animal-human bond is nurtured and all animals are treated with compassion and respect.